Place the apples in the bottom of the dutch oven. I cut my apples into six slices, then cut those slices in half. Top the apples with all of the other ingredients making sure the butter is on the very top of the ingredient pile. Put the lid on the dutch oven and place it inside your oven. Once the oven is preheated, set the timer for 30 minutes. 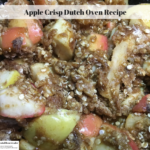 Every ten minutes, remove the lid on the dutch oven and give the apple crisp a stir to combine the ingredients. When the timer goes off, check to make sure the apples are soft and serve immediately. Top with ice cream or whipped cream if you desire. Note: I chose to make my apple crisp in an oven, but by simply placing BBQ brickets under and on top of the lid of your dutch oven you can make this outdoors. I recommend putting 16 coals on top of the lid and 8 underneath the dutch oven. Over a fire, the recipe is done when the apples are soft and the toppings are brown – which should be 25 to 30 minutes depending on how hot the coals are when you start.